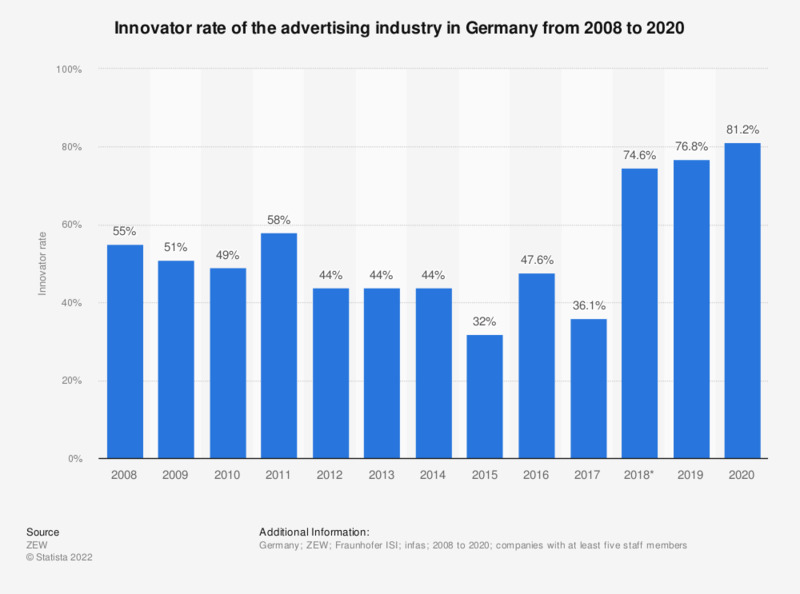 This statistic shows the innovator rate of the advertising industry in Germany from 2008 to 2017. The innovator rate of this industry refers to the share of companies that successfully completed at least one product innovation within the preceding three years. At that, it is irrelevant whether or not another company already introduced this innovation. In 2017, the advertising industry in Germany had an innovator rate of roughly 36.1 percent. According to the source, the German innovation survey is carried out on behalf of the German department of education (Bundesministerium für Bildung und Forschung). It is conducted by the Centre for European Economic Research (ZEW, Mannheim), which has cooperated with infas (Institute for Applied Social Sciences) and the Fraunhofer Institute for Systems and Innovation Research (ISI) since 1993. The survey takes into account all companies in Germany with a minimum of at least five employees whose economic focus lies in the relevant sector. Definitions and measuring concepts correspond with the international standards of OECD and Eurostat. Every other year, the innovation survey is part of the European Community Innovation Survey (CIS) coordinated by Eurostat. All figures were projected to the population of companies with a minimum of five employees in Germany. More than 17,200 companies took part in the 2018 innovation survey (= 57 percent of random sample), 263 of which belonged to the consulting and advertising sector. Advertising (WZ08 73): advertising agencies, marketing and placement of advertising time slots and spaces, market and opinion research.